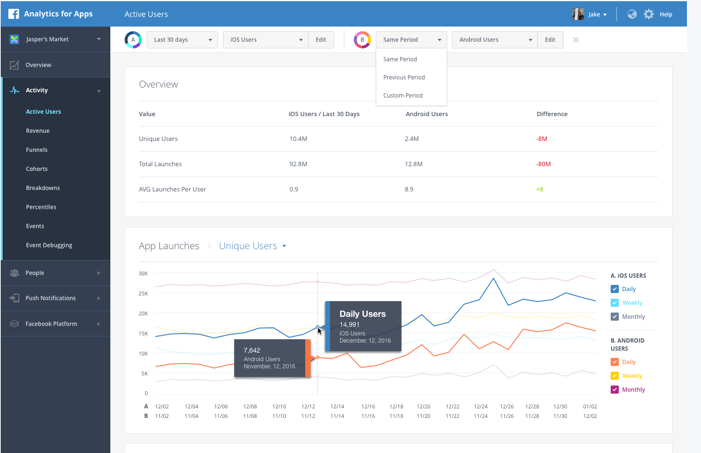 Facebook has launched an update to Analytics for Apps, its cross-platform analytics platform for developers who want to track how their users engage with their sites, bots and apps. The promise of Analytics for Apps is that it allows developers to better understand their audience and then use this data to better engage them through push and in-app notifications. As Facebook announced today, Analytics for Apps users have integrated the service into one million apps, website and bots since its launch in 2015. Bots are obviously a rather new phenomenon, but the company added support for them into the service about three months ago. With today’s update, the company is adding two major new features to the service that will make it more useful for the product managers and marketers that may use it inside a company. The first is the ability to compare two customer segments side-by-side. Say you want to see how customers in one country are using a service compared to another country. That wasn’t very easy to do in earlier versions of the service but it now only takes a few clicks to see this data. You can also split data by which device people used, their demographics, etc. The second new feature focused on giving users more insights into where their customers actually come from. You could already track users across desktop and mobile, but now the service also supports referring domains so you can see where your users are coming from. Analytics for Apps is far from the only player in this market, of course. Its competitors include heavyweights like Google Analytics and Google’s Firebase Analytics service as well as Mixpanel and, depending on the use case, Leanplum and others. Given the social networking service at the core of its business, Facebook, of course, promises that it can give its users better insights into their customers’ demographics than its competitors.